Warning, chocolate pudding cake made too easy! Yesterday was kind of crazy here. I had early pick ups from school and a parent teacher conference right after that. On top of all of that...it was raining so we were all locked inside together! The boys had their friend over from next door and treats were needed! 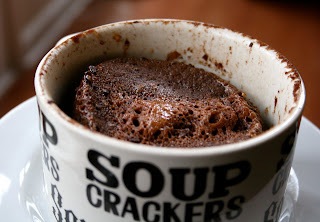 I made this chocolate cake in a cup a couple of months ago on a whim after seeing it around the web. The boys remembered it and asked for it yesterday. I had everything it takes and it comes together easily so I figured, why not??? This is definitely for people that like dense chocolate cake. It is a cross between chocolate cake and chocolate pudding. These are not pretty by any means. But, they are a great sweet treat that can be dressed up with a little whipped cream or ice cream! 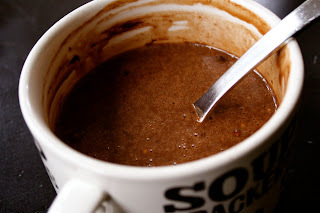 So, if you are stressed for time, don't want to spend a lot of time on dishes and need a quick chocolate treat...this is a great recipe to keep on hand! 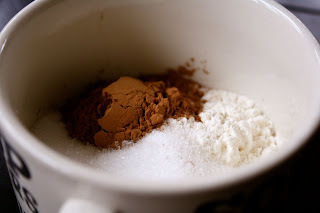 Combine the dry ingredients in a large mug. 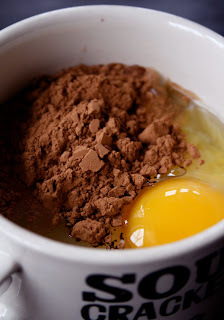 Then add the rest of the ingredients and mix very well. 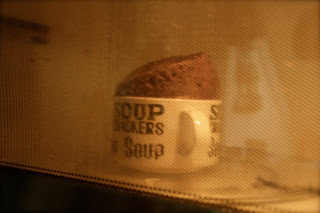 Cook for 3 minutes in the microwave. Watch it puff up like crazy. Allow to cool for a minute and then enjoy with whipped cream or ice cream! I am running right home to make this tonight! Sounds warm and yummy on a cold and rainy winter day. Cake in a cup? This is a college student's dream come true :) Thanks for the recipe! Thanks for finally posting this recipe. I can't wait to try it with my little one tonight (and of course one for mommy, too)! if only eggs worked for me. sigh. they do not. at all. total reactions. BUT glad that choc chip info works for you. Ya know, all dark or semi sweet chips that dont have milk solids are inherently dairy free and although i would never tell someone w/ life threatening allergies to "Go ahead it's totally fine" i think for most ppl they are actually "fine". However, to each her own! Youll have to let me know what you end up using/trying in the choc chip department! ha, that's great and looks delicious! Hey I made this with the applesauce instead of oil and it worked great! definitely LMK how the GF Vegan pancakes turn out for you if you end up making them....thankx for the comment and letting me know you guys are obvi dairy free and mostly GF! cool! 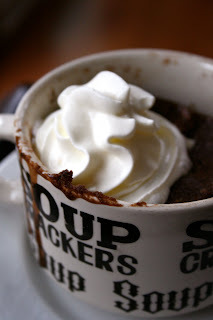 Cake in a cup sounds like a great idea. I just left the egg out and it was great- it didn't rise as much in the microwave but it sure tasted terribly good! Junk Food Flavors Made Healthy!